For testing if 3 or more variables have identical population means, our first option is a repeated measures ANOVA. This requires our data to meet some assumptions -like normally distributed variables. If such assumptions aren't met, then our second option is the Friedman test: a nonparametric alternative for a repeated-measures ANOVA. Strictly, the Friedman test can be used on metric or ordinal variables but ties may be an issue in the latter case. The Friedman Test - How Does it Work? The original variables are ranked within cases. The mean ranks over cases are computed. If the original variables have similar distributions, then the mean ranks should be roughly equal. 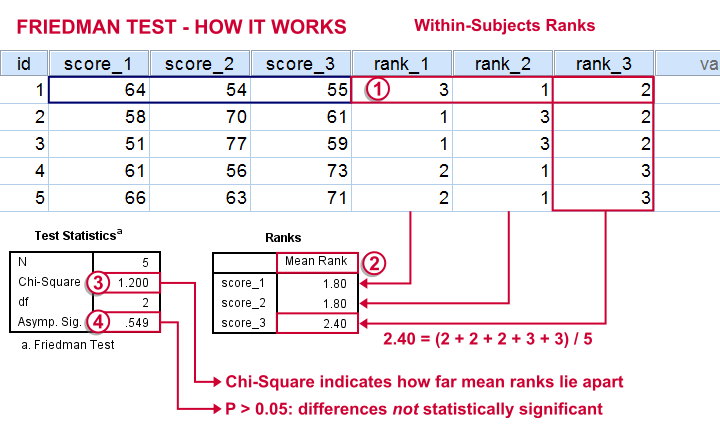 The test-statistic, Chi-Square is like a variance over the mean ranks: it's 0 when the mean ranks are exactly equal and becomes larger as they lie further apart.In ANOVA we find a similar concept: the “mean square between” is basically the variance between sample means. This is explained in ANOVA - What Is It?. Asymp. Sig. is our significance level. It's the probability of finding our sample differences if the population distributions are equal. The differences in our sample have a large (0.55 or 55%) chance of occurring. They don't contradict our hypothesis of equal population distributions. Let's first take a look at our data in adratings.sav, part of which are shown below. The data contain 18 respondents who rated 3 commercials for cars on a percent (0% through 100% attractive) scale. We'd like to know which commercial performs best in the population. So we'll first see if the mean ratings in our sample are different. If so, the next question is if they're different enough to conclude that the same holds for our population at large. That is, our null hypothesis is that the population distributions of our 3 rating variables are identical. Inspecting the histograms of our rating variables will give us a lot of insight into our data with minimal effort. We'll create them by running the syntax below. *Inspect histograms with normal distributions superimposed. Most importantly, our data look plausible: we don't see any outrageous values or patterns. Note that the mean ratings are pretty different: 83, 55 and 66. Every histogram is based on all 18 cases so there's no missing values to worry about. Now, by superimposing normal curves over our histograms, we do see that our variables are not quite normally distributed as required for repeated measures ANOVA. This isn't a serious problem for larger sample sizes (say, n > 25 or so) but we've only 18 cases now. We'll therefore play it safe and use a Friedman test instead. K Related Samples means that we'll compare 3 or more variables measured on the same respondents. This is similar to “within-subjects effect” we find in repeated measures ANOVA. Depending on your SPSS license, you may or may not have the Exact button. If you do, fill it out as below and otherwise just skip it. Following these steps results in the syntax below (you'll have 1 extra line if you selected the exact statistics). Let's run it. First note that the mean ranks differ quite a lot in favor of the first (“Family Car”) commercial. Unsurprisingly, the mean ranks have the same order as the means we saw in our histogram. Chi-Square (more correctly referred to as Friedman’s Q) is our test statistic. It basically summarizes how differently our commercials were rated in a single number. df are the degrees of freedom associated with our test statistic. It's equal to the number of variables we compare - 1. In our example, 3 variables - 1 = 2 degrees of freedom. Asymp. Sig. is an approximate significance level. Since p < 0.05, we refute the null hypothesis of equal population distributions.“Asymp” is short for “asymptotic”: the more our sample size increases towards infinity, the more the sampling distribution of Friedman’s Q becomes similar to a χ2 distribution. Reversely, this χ2 approximation is less precise for smaller samples. Exact Sig. is the exact p-value. If available, we prefer it over the asymptotic p-value, especially for smaller sample sizes.If there's an exact p-value, then why would anybody ever use an approximate p-value? The basic reason is that the exact p-value requires very heavy computations, especially for larger sample sizes. Modern computers deal with this pretty well but this hasn't always been the case. As indicated previously, we'll include the entire table of mean ranks in our report. This tells you wich commercial was rated best versus worst. Furthermore, we could write something like “a Friedman test indicated that our commercials were rated differently, χ2(2) = 8.65, p = 0.013.“ We personally disagree with this reporting guideline. We feel Friedman’s Q should be called “Friedman’s Q” instead of “χ2”. The latter is merely an approximation that may or may not be involved when calculating the p-value. Furthermore, this approximation becomes less accurate as the sample size decreases. Friedman’s Q is by no means the same thing as χ2 so we feel they should not be used interchangeably. So much for the Friedman test in SPSS. I hope you found this tutorial useful. Thanks for reading. P.s. you might want to take a look at Simple Overview Statistical Comparison Tests as well. If all participants used both methods, your first choice is a paired samples t-test. If you don't meet the assumptions for this test, go for a Wilcoxon signed-ranks test. If some participants used method A and other participants used method B, your first choice is an independent samples t test. If you don't meet the assumptions, go for a Mann-Whitney test. You might consider adding one or more covariates to both t-tests (but not the nonparametric tests). This would come down to ANCOVA which -unfortunately- I haven't been able to cover yet. Very helpful, but can one compare two methods using Friedman Test? If yes, then how?